Geomant has nearly 20 years’ experience delivering systems integration to businesses around the world, enabling them to deliver exceptional customer service through their contact centres, and the launch of Gemma, their showcase FAQ chat bot, is evidence of a keen eye on the future and the development of exciting new technologies. AI is seen as a critical tool for businesses looking to future-proof their contact centre, drive up sales revenue, capture and analyse customer behaviour data and ensure that new customer demographics, with new interaction behaviours, are well-served by a range of digital channels. Geomant’s AI Services division develops solutions for businesses that are on the pathway to implementing AI, designing a range of Virtual Assistant Bots and designing custom AI projects to personalise and optimise customer experience. Virtual Assistant Bots, such as FAQ Chat Bots, are the ideal starting point for AI adoption, enabling a business to solve common customer queries (for example, “Where is my order?”), both freeing up agents from boring, repetitive tasks and enabling customers to resolve issues 24/7. 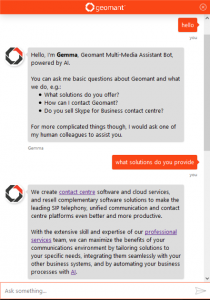 Geomant’s Gemma FAQ Bot demonstrates how AI-driven customer service can help to answer customers’ common questions, in this case about the company, its products and services, and how to take the next steps in the implementation of this new technology to benefit your business. Why not click the icon at the bottom of the page, and find out for yourself how powerful a tool AI can be in assisting query resolution around the clock? Forbes commented this month that 8 out of 10 companies are either implementing chatbots now or intend to by 2020 – don’t get left behind. Geomant’s AI Practice has all the required knowledge and skills to advise you and ensure a successful implementation of your own chatbot or other AI project that will best suit your requirements.